After a long day of exploring Zion's incredible canyons and towering monoliths you can satisfy your hunger at one of the several nearby restaurants. Whether you are looking for a quick bite to eat or a taste of exquisite cuisine, the Zion National Park area has something to satisfy every palette. 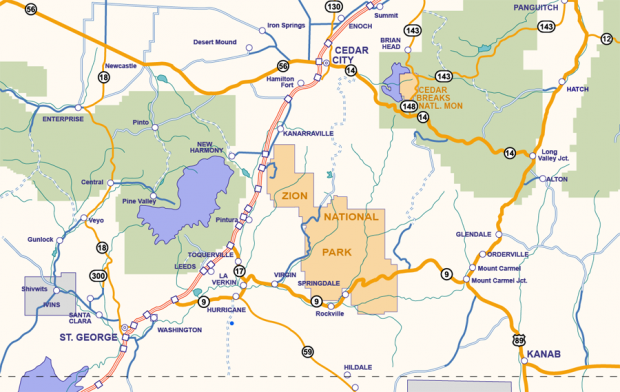 While visiting Zion National Park you can choose from restaurants just outside of the park in Springdale or travel a little farther to St. George, Cedar City, or Mt. Carmel. This page contains links to some of the great places to get a bite to eat in the Zion National Park area. For additional dining options visit our sister site for Springdale Resturants! For additional dining options visit out sister site for St George Resturants! For additional dining options visit out sister site for Cedar City Resturants! Because Bryce Canyon is so close to Zion National Park many it's easy to visit both magnificent areas. If this is your plan we have included some listing for Bryce Canyon Dining also. Or you can of course just visit the Bryce Canyon National Park page.